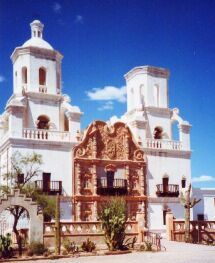 Founded in 1692 by Father Eusebio Francisco Kino, the San Xavier Mission can be found around 10 miles south of downtown Tucson, Arizona. 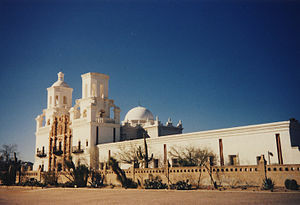 This huge white building on the San Xavier Indian Reservation was named after an innovator and Christian missionary. Because natural springs used to be in the area, the mission was often called the “place where the water appears”. The original building was only two miles away from the present day structure. In 1770, it was attack by Apache and destroyed. They started the construction on the present building in 1783 and finish by 1797. The massive structure is a Moorish inspired design, adobe, with large wood-carved doors to greet you at the entrance. Inside, you will be amazed by the many statues and mural paintings. You feel like you have been transported back in time as you walk around the mission. The place has often been referred to as “the white dove of the desert”. 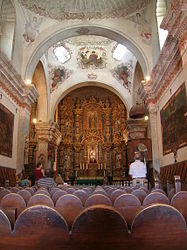 The church retains its original purpose of ministering to the religious needs of its parishioners. Today, it still serves the Native community. I haven’t seen the place since I was little, but it is on my list of places to revisit in Arizona.